It’s the perfect time to reassess our content marketing strategies for the year ahead. Earlier this year, we polled our audience on their content marketing resolutions for 2019. Boy were the outcomes enlightening! What is the most important goal you are trying to accomplish in 2019? Perhaps not surprisingly, a plurality of respondents had one clear priority: 49 percent said that increasing inbound leads is the most important goal they are trying to accomplish in 2019. “Increase organic traffic” and “improve thought leadership” came in second and third place, with 19 percent and 15 percent respectively. In contrast, only 4 percent of respondents selected “increasing outbound leads” as their highest priority. 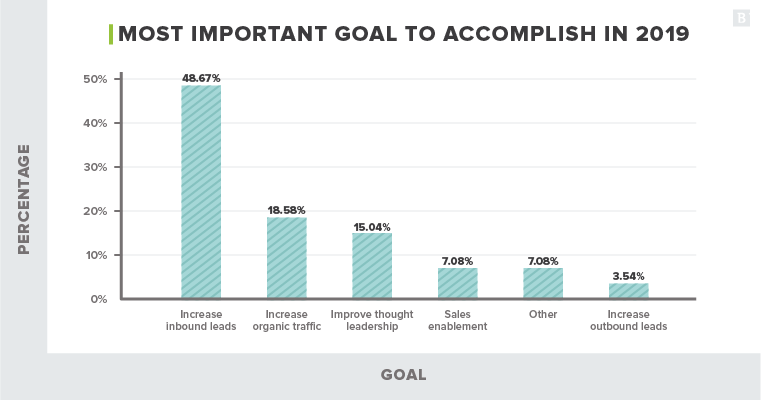 A small batch of respondents (7 percent) chose to write in their own goals, which, while brief, centered around two main themes: actually converting traffic and procuring better quality leads. Overall, these responses tell us a few things. First, our audience is clearly in favor of inbound marketing compared to outbound given their focus on improving inbound lead generation for 2019. Second, it would seem that most marketers have already got a working inbound marketing strategy in place at this stage and are now looking to refine and improve their results. The open-ended responses that called for increased conversions and better qualified leads suggest that their inbound strategies are already working to bring leads in the door, but they now need to get better as closing them. Marketers are not new to inbound marketing anymore. For 2019 and beyond, it’s all about refinement and quality. What strategy failed in 2018 that you will definitely not be doing in 2019? At this stage in the game, us marketers can agree that producing smaller amounts of high-quality content is better than producing myriad low-quality content. If you can swing it, it’s great to provide your audience with the best content possible and always be thinking about what value you can bring to the table. But what if that hinders sharing content regularly? This one is pretty straightforward. A number of respondents felt that doing nothing (aka not doing any content marketing whatsoever) was their downfall in 2018. Other respondents mentioned they did not have enough variety in their marketing strategies to achieve their desired results last year. However, doing nothing or not enough is perhaps better than just doing content marketing for the sake of doing content marketing. Meaning, they were spending resources all willy nilly without a defined strategy, measured results or even expected outcomes in place. That or they weren’t focusing their efforts on what worked. As the majority of businesses these days adopt some form of a content marketing strategy and start sending content into the ether, it’s best to always be analyzing (ABA). Remember to use data to determine what’s working and what isn’t. From there, adjust your strategy on an ongoing basis (monthly, quarterly, etc). Don’t just do this once a year. Other strategies respondents are planning to ditch (or do less of) in 2019? Sticking with an outdated website, placing too much spend on paid social (specifically Twitter, Facebook and Instagram) and link building. ^ We hear you loud and clear! ^ Oof, someone’s obviously got a bone to pick. ^ Not feelin’ that free-99 life anymore. ^ Pro-tip: Always stick to the plan. ^ RIP Facebook’s user base. How important will the below marketing strategies be for you in 2019? After looking at marketers’ most important 2019 goals and those strategies they planned to leave back in 2018, we wanted to know how they were prioritizing their actions for the new year. Which campaigns did they plan to double-down on and which were ultimately less important? 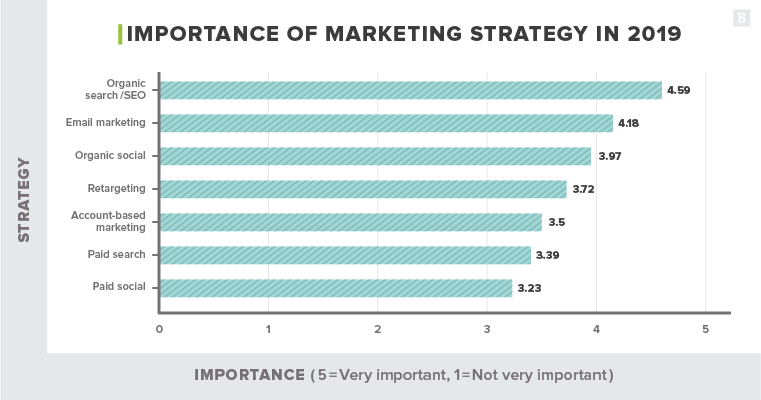 We asked them to rate a series of marketing strategies on importance and impact for 2019 using a scale from 1 to 5 (1 being “not at all important” and 5 being “very important”). 69 percent of marketers noted that organic search/SEO will be very important in 2019. 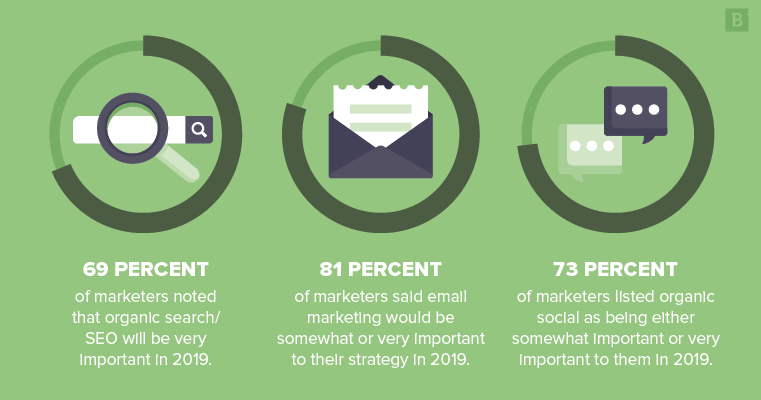 81 percent of marketers said email marketing would be somewhat or very important to their strategy in 2019. 73 percent of marketers listed organic social as being either somewhat important or very important to them in 2019. There is a clear preference in organic vs paid strategies, especially since paid social scored the lowest in the group. Likely, the prioritization of individual over brand and the rapidly changing algorithms of the biggest social platforms make it more difficult to reap rewards from a paid strategy perspective. Retargeting, account-based marketing and paid search strategies rested in the middle ground with respondents. This isn’t surprising, as these strategies are still effective at complementing a strategy focused on organic search, organic social and email marketing. Since all of the strategies above scored relatively high, we can see that marketers are looking at a variety of avenues to build the strongest possible marketing strategy in 2019. We had a bit of fun with this final survey question. We asked marketers to choose just one word to describe what they are most excited about for 2019. While some answers were a bit longer than one word (hey, not everyone is great at following directions! :P), most were positive and forward-thinking. “Content” was found in 8 percent of responses. 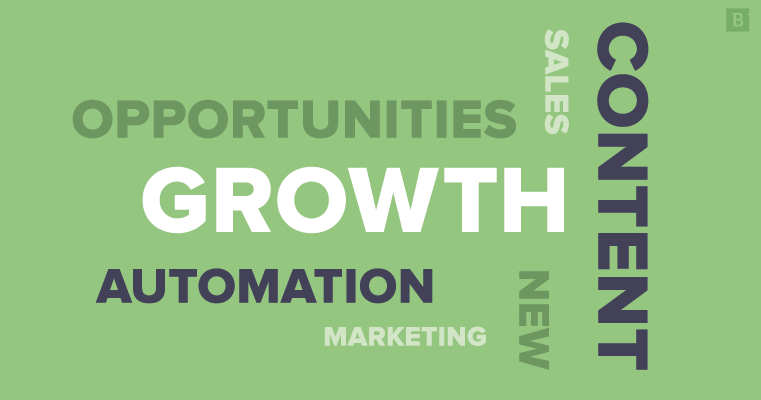 Marketers wrote the words “opportunities” and “automation” 5 percent of the time. “New” was noted 4 percent of the time. “Sales” and “marketing” were both mentioned 3 percent respectively. To summarize, we’re looking to convert more traffic with better leads and more customized communications. We will achieve this by creating quality content (at a consistent clip), and not straying too far from our main content marketing goals. That means, fewer April Fool’s promotions, Facebook boosts, non-targeted emails and the like. Oh, and we’re very much looking forward to growth, donuts and summer in the new year. What are your biggest plans for content marketing this year? What strategies are you ditching for good? What’s the one word you’re envisioning for your marketing focus in 2019? Is it donuts?